SpyCrushers rep announce the debut of their SpyCrushers Spy Camera Sunglasses on Amazon US and Amazon UK websites. Geneva, IL - SpyCrushers rep announce the debut of their SpyCrushers Spy Camera Sunglasses on Amazon US and Amazon UK websites. At a recently held press conference at Crushers, Inc. headquarters in Geneva, IL, SpyCrushers president Ryan Anderson announce the debut of their camera sunglasses on Amazon.com and Amazon.co.uk. “We are pleased to announce the debut of our popular camera sunglasses on Amazon.com and Amazon.com.uk. Our recent expansion into the European territories has proven to be very advantageous for our SpyCrushers brand of products,” said Anderson. According to Anderson the company’s spy camera sunglasses are currently available for purchase on Amazon US for $24.97 and on Amazon UK for £15.97. Both offering include the camera sunglasses, a travel case, a cleaning cloth, a micro 2.0 USB cable and operating instructions. A maximum size 8GB micro sd card is recommended for use with the camera glasses for storing recorded media and images. Purchasers also receive a new replacement or money back guarantee should one not be completely satisfied with their item. “Our camera glasses are a number one category seller on Amazon in the US and our plan is to have the same sales velocity on Amazon in the United Kingdom,” said Anderson. Anderson concluded by stating that their camera sunglasses Amazon UK customer feedback has been extremely positive and shoppers of the United Kingdom Amazon site have already begun posting very favorable reviews for the camera sunglasses product. 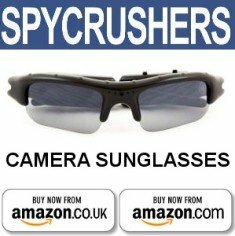 The SpyCrushers Spy Camera Sunglasses can be found on Amazon US and Amazon UK when using the search phrase spycrushers camera sunglasses inside any open Amazom.com or Amazon.co.uk search bar found on any of the aforementioned websites.